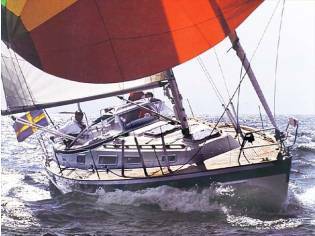 Great example with new standing rigging in 2017. 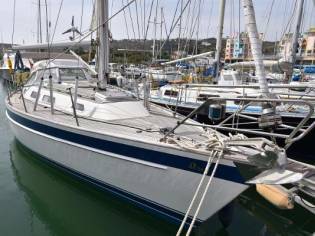 Popular tiller and fully battened main specification. 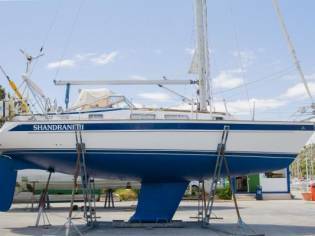 MARALUNA II has been lightly used for Solent based sailing and always professionally maintained. 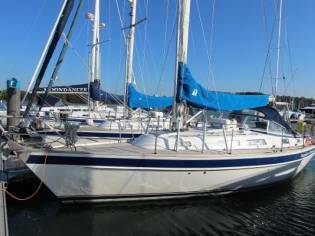 The Hallberg-Rassy 34 is the perfect choice for short to medium range cruising. 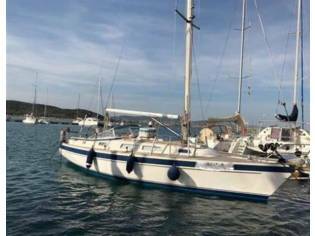 Her comfortable accommodation and excellent sea-keeping make living and sailing onboard a pleasure . GENERAL: Interior finished in mahogany with matt silk varnish. Standing headroom throughout the vessel. Skybeams, opening seaportholes and ventilators for ventilation. Wooden inner frames for the skybeams. Deluxe cushioning in blue. Blue curtains (New Feb 2015) and blue detachable carpets throughout the vessel except in bow of the galley. Varnished platforms in teak with inlaid holly stripes. Headlining accentuated with mahogany inlays. MAIN SALOON: Straight settee to starboard and L-shaped settee to seaport with safes above and storage space underneath. Lee-cloths to both docks. Bookshelves to both sides. Dropleaf bar desk with bottle storage in centre Kenwood player radio/CD player with iPod interface/charger. LED bulbs in spotbeams, galley overhead beam. GALLEY: Plastimo Neptune 2000 gimballed cooker with oven and grill to seaport. Stainless steel deep double sinks with pressurised hot and chilly water. Stowage for cooking utensils and stores, chopping board, drawers and waste bin. 12v refrigeration group in insulated cool box. (serviced and recharged May 2014. Opening gustow above the galley. CHART TABLE: Forward facing blueprint desk to starboard with chair. Chart storage in desk with drawers under. Instrument shelf. Electric switch panel with charger monitor, voltmeter, gasoline and water gauges. 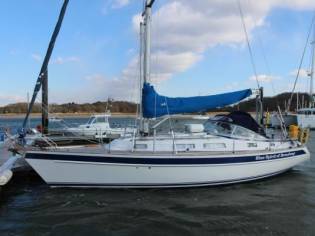 FORWARD CABIN: Double dock 2.03m long and 2.04m wide at the widest part. Fitted sheets. On both sides there are safes above and storage below with access doors under the dock. Hanging safe on seaport side and various safes on starboard side. Door leading to bar. 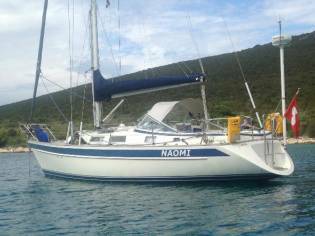 AFT CABIN: Double dock 2.13m long, 1.66m wide at widest part. Fitted sheets Hanging safe. Lockers above dock and storage below. Door leading to bar. Two opening seaportholes for ventilation. TOILET COMPARTMENT: Interior lining and cupboard in white matt Resopal. Shower stall with teak grating. 12v shower waste pump. Manual pump action sea toilet. Holding basin with gauge. China wash basin with storage above and below. Pressurised hot and chilly new water. Mirror. Two opening seaportholes for ventilation. WATER: Pressurised new water system to quantity compartment and galley with accumulator basin. Reserve foot pump in the galley. Insulated calorifier heated by engine and 230v immersion element (replaced 2009). Manual bilge pump and electric emergency bilge pump. HEATING: Webasto Air Top 24 diesel heater with outlets in forward compartment, bar, aft compartment and quantity. 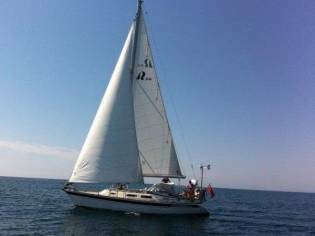 You can buy this Hallberg-Rassy 34, sailing cruiser of the 1999 for 104.082€. This boat of 10,20m of length and 3.35m of beam can be found in Hampshire (United Kingdom).